I first became interested in Genealogy as a child when I was told that one of my mother paternal grandmothers – Emily Letitia Baggett – was a Spanish lady from Jamaica. 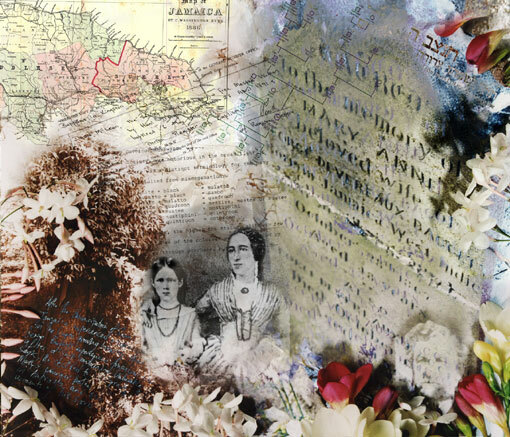 To a child from New Zealand, this Spanish ancestry sounded exotic, – but the truth turned out to be far more fascinating. Her mother Mary Anne McLean was of “mixed ancestry” – both of her grandmothers were born slaves, and her paternal grandfather was Hananel D’Aguilar, the son of Baron D’Aguilar. After my mothers brother died in 2001, my mother went to his funeral in the North Island, and came back with bits of family history from the Jamaican branch of the family tree. This further ignited my interest in genealogy. Most of the original genealogical research that I’ve done has been on my mothers maternal ancestry, but nonetheless, the Jamaican branch of my family tree still continues to fascinate me. I therefore expected that any African ancestry would be well below the threshold of detection by any genetic test, in both my mother and myself. 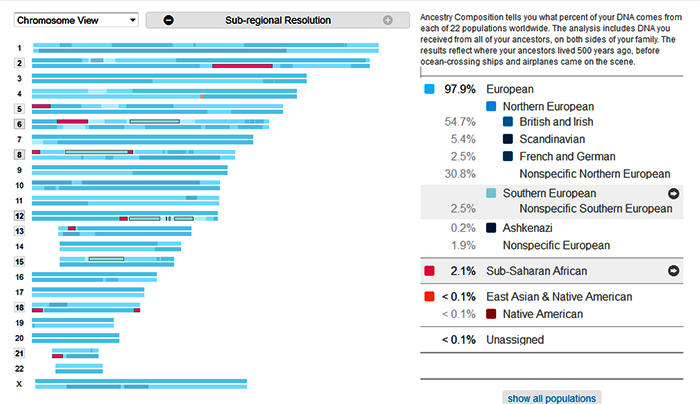 I was therefore quite surprised when my 23andMe Ancestry painting showed several “African” segments. There was effectively 10x more “African DNA” than would be expected based on the theoretical % inherited from that ancestor. There are two possible explanations to explain this – More than the theoretical percentage of ancestry was inherited from that ancestor due to random chance in the recombinational process over several generations, or it might be possible that Mary Anne McLeans mother (Mary Anne Kentish) was also of “mixed ancestry”. Now that I know (from a third cousin) that Mary Anne’s maternal grandmother was a slave – so thus, yes, Mary Anne Kentish was also of “mixed ancestry”. One curious fact that I wondered about over the last 10 years was that David McLean and Mary Anne Kentish did not marry until 1841 – 22 years after their eldest daughter Mary Anne Mclean was born (and just 4 years before their grand-daughter Emily Letitia Baggett was born). In Jamaica, slavery was abolished between 1833-1838. Since then, I have had more family members tested, and 23andMe’s chromosome painting analysis has also been significantly updated. 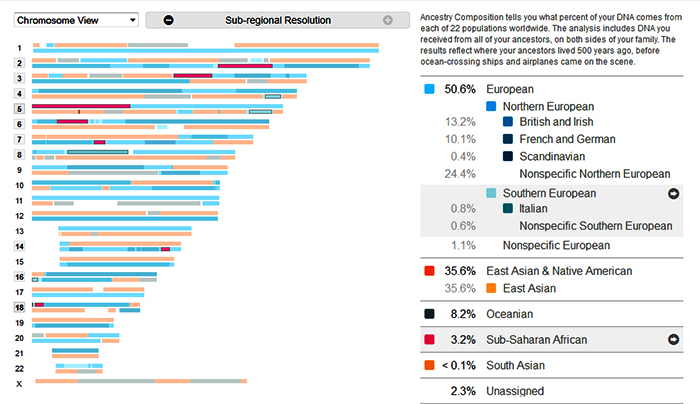 What is most fascinating with 23andMe’s updated analysis is that adjacent to a small African segment on chromosome 8, there is a large “Southern European” segment. We have one putative 2nd cousin who shows this exact same pair of adjacent segments. Below I show my mothers results, and my cousins results (the son of my mothers late brother). (My Cousin; 7 segments, 3.25% (my cousin’s Asian/Oceanian is Polynesian from his mother, they are NZ Maori). Calculating the %’s of Southern European we have from our Jamaican ancestry is a bit more complicated, as my 3 siblings have some Southern European from their father, and my son’s paternal ancestry is largely Southern European. I also am a descendant of Emily Letitia Baggett and we believe there is slave blood but I hadn’t realized it was through the McClean side.